Tuleta marker, Bee County. Courtesy of Ken Rudine. Image available on the Internet and included in accordance with Title 17 U.S.C. Section 107. TULETA, TEXAS. Tuleta is on State Highway 181 twelve miles north of Beeville in north Bee County. It was founded by Peter Unzicker, a Mennonite minister, who brought a colony of Mennonites from Cullom, Illinois, in 1906. 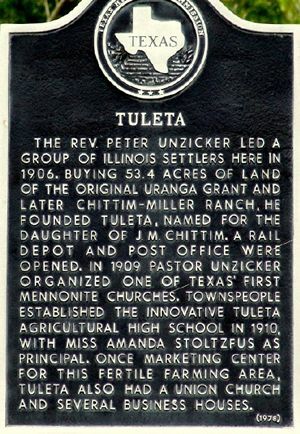 Unzicker, a German, purchased 54½ acres of land from the Chittum-Miller ranch for the townsite, which was named for J. M. Chittum's daughter. The San Antonio and Aransas Pass Railway was built across the ranch in 1881. The depot opened in Tuleta in 1906; the following year the post office opened. The Mennonite church, built that year, was used for school on weekdays. In 1910 Amanda Stoltzfus organized the Tuleta Agriculture High School, the first of its kind in Texas; its faculty came from such prestigious institutions as Smith College and the University of Wisconsin. Mrs. Stoltzfus, the principal, offered instruction in sewing and cooking for girls and manual training and agriculture for boys. The school had dormitories for boarders. Tuleta once had three churches-Mennonite, Presbyterian, and Baptist-of which only the Baptist remained in 1990. Among the early businesses were Stoltzfus Mercantile Company and Gin, Unzicker Grocery and Grist Mill, Dirks Brothers Lumber Yard and Garage, Speer's Coffee Shop, the Rapp Hotel, and the Hall Hotel. Oil and gas were discovered west of Tuleta in 1929, when the population was 150. Several oil companies were still in operation in 1990, as were a grocery store, a water well service, and a community center. The community celebrates Tuleta Day on the second Saturday in August. In 1989 its population was 189. In 1990 it was ninety-eight. The population reached 292 in 2000. Grace Bauer, Bee County Centennial, 1858–1958 (Bee County Centennial, 1958). Handbook of Texas Online, Willa Mae Chandler, "TULETA, TX," accessed April 20, 2019, http://www.tshaonline.org/handbook/online/articles/hnt31.